What a food year 2015 was! The restaurant scene in Portland and the surrounding areas was the busiest it’s ever been – new restaurants opening weekly, some closing for various reasons, and a host of them making regional and national food news as usual. A huge congratulations goes out to all the chefs, wait staff, management, and others who work so hard every day to create a universe of food and drink that draws people from literally all over the world to here in little Portland, Maine. Hardly ever do I go to a restaurant in this area that I feel is not good and when I travel, I often miss the quality of food we are so lucky to have. The level of culinary skill in these parts is on par with any city in the country. Period. Because our great city provides such amazing experiences in the way of food, its prices seem to have grown alongside it’s reputation. For that reason, I put more emphasis on overall value than ever in comparing restaurants for this article. While I’m always willing to try someplace once at almost any price, the ones that offer great value are the ones that keep me coming back for more. Oftentimes, the final determination of this comes primarily from whether or not I felt I got my money’s worth as I was on my way out the door and whether or not the cost justifies a return trip in the near future. Fortunately, regardless of price, you’re likely to get a good meal wherever you go in Portland, but this time, I weighed value more than I have in the past. This year’s award winners, as always, are picked from among all the places I’ve reviewed in the previous year. I spent lots of time visiting lots of eateries, paid lots of money for meals, and wrote lots of reviews all just so I could let you know what to eat and where to eat it. To determine the best of the best, in addition to value, I took into account all aspects of the dining experience including food, service, atmosphere, and how well each restaurant performed relative to similar restaurants in the area. While the vast majority of the places I visit provided at least a very good experience, this is where I tell you who I thought truly stood out from the crowd. Lastly, before getting started, I’d like to thank you for your readership and thank the restaurants who invited me to sample their menus too. You are all very much appreciated and without you I’d just be some weird guy who eats a lot and writes to himself about food. Instead, I’m a weird guy who eats a lot and writes to you about food. With that said, let’s get down to business and talk about why we’re all here in the blogosphere right now. Without further adieu, I present to you the definitive list of restaurants you should visit immediately after reading and this year’s Eating Portland, ME award winners with links to my initial review. In my opinion, the sweet spot for the price of a restaurant meal falls somewhere between the $15-$50 range. That excludes drinks, tax, tip, and whatever other costs might be involved. While that range is large, it takes into account that you truly can get a good meal at almost any price. It also assumes that meals which cost less are unlikely to be of a certain quality. Higher costs make it difficult to exceed the expectations created by the large price tag. 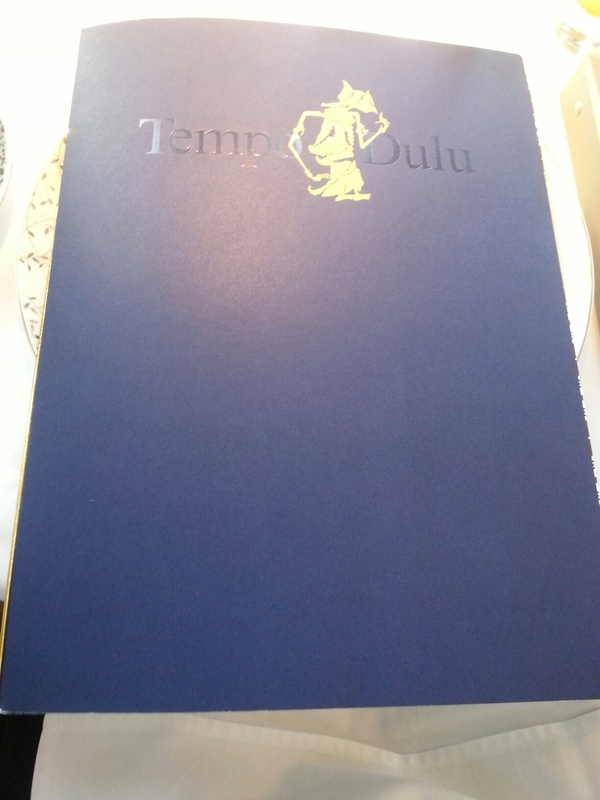 Because of that and my whole diatribe about value, it might seem odd that my restaurant of the year is Tempo Dulu, but indeed it is. When I went to Tempo Dulu shortly after they opened, I knew they were pricey and I expected a lot as I had heard that preliminary reviews were exceedingly positive. By the time my meal was done, I signed the credit card slip, paying well over $200, and thought I might have somehow gotten away with something because I couldn’t believe the massive quantity of absolutely delicious food I had eaten. My meal produced endless exclamations of joy from start to finish and in addition to magnificent food, the service and atmosphere were also nothing short of perfect. I haven’t stopped talking about Tempo Dulu since I went, recommending to everyone with whom I discuss food that they save their money and get there as soon as they possibly can. With three tasting menus and an endless number of drinks of all types, their options are sure to do much more than just satisfy the most discerning of food connoisseur. I guarantee that if you consider yourself a lover of food and drink, TD will meet your every need. Just make sure you go there hungry, because despite the very high price, they will be sure to earn every single penny of your cash. Central Provisions has a stellar reputation and for a damn good reason – they serve food that is unquestionably awesome. The purveyor of small plates puts a ton of thought and care into each dish and it shows. Both their lunch and dinner menus offer a wide range of tastes which wowed me with every single bite every time I was there. From vegetables and seafood to meat and sandwiches, their ability to create magic keeps hordes of people waiting in line for the chance to sample their many items. During my first visit there, we ordered a bunch of plates and they were all brilliant. We also ended with one of the best desserts I had had in recent memory. As far as I can tell, Empire is doing just about everything correctly. In a city that was craving more and better Chinese food a few years ago, they have taken traditional Americanized Chinese, made it a little more authentic Chinese, and given Portland a go-to location – maybe the only location – for that exact thing. Their menu offers some items you might see on the typical Chinese menu, but is punctuated by some you won’t and all at a price that will keep your wallet fat. Every food we had there was really, really good and the service was excellent too. It’s no coincidence that they stay very busy and unless something significant happens, I don’t see that changing at all. Miyake serves up some ridiculously good sushi which will give any sushi seller a run for their money. The prices aren’t cheap, but regardless, you’ll leave wanting to come back as soon as possible for the beautifully created rolls which have a taste that is difficult to beat. Everything else they serve is delicious too, so don’t be afraid to order a salad or soup or anything else, because it’s all done to exacting and very high standards. Though it was open previously under a different name and and is mostly the same otherwise, The Treehouse is still my best new restaurant of 2015. Unfortunately, I did a terrible job as a customer in my visit there because I ate too much earlier in the day. Despite that mistake, I was impressed by them at every turn. My drink, app, and especially the main course were all brilliantly executed with the scallop portion of my meal being a uniquely delicious take on the seafood that I don’t ever remember seeing anywhere else. It should also be noted that they are getting lots of interest from Portland restaurant patrons lately, so it seems they are making a well-deserved name for themselves. Roustabout seems to have their own view of Italian food and it’s a good one. They spared no expense with the creation of their seafood salad which packed in more delicious seafood than I ever could have expected and their excellent house made sausages were nicely seasoned. Since they were so new when we went, they had the advantage of lots of local media and word of mouth which caused them to be very busy, even having to turn away people without reservations. If they maintain their food quality, they’ll probably have to continue doing that. With lots of Greek names on their menu, Emilitsa serves food that is as complex to pronounce as it is in flavor. Was my favorite part of the meal the chef’s courtesy app of lentil puree and crisp bread, the jalapeno and feta spread, my chicken with cinnamon wine sauce, or the beautiful baklava? It’s virtually impossible to decide, but every step of the way, I was surprised at how different each course was from what I was used to at other restaurants. Maybe that’s because there aren’t really any other Greek restaurants in Portland. Regardless, Emilitsa made me incredibly happy and there was nothing I regretted after leaving except maybe that I didn’t sit at the really cool bar. Except for one mistake which I suspect was a one-time incident, The Velveteen Habit was virtually perfect. Both their food and drinks provided me with everything I could have asked for in a meal and the fact that a lot of it came from their garden is cool as hell and added an element of unparalleled freshness to their food. Their tots were to die for and the crabapple rye infusion was like nothing I ever had. I wouldn’t hesitate to go again and even though their location is a little remote, it’s still worth making the trip to the beautiful location in Cape Neddick. Despite hearing some reviews to the contrary, my wife and I experienced nothing but stellar examples of bar food at a great price from Tomaso’s Canteen. Their fried mozzarella balls were the most beautiful presentation of fried cheese I’ve ever seen and their sandwiches were both large and very tasty. The cool neighborhood atmosphere certainly adds a fun element to what they offer and it’ll be nice to see another successful restaurant/bar in that location. Next time I go, I’ll definitely sample something from their ample list of beverages and try some additional food items. Taco Escobarr produced some great Mexican food for little in the way of cash. Their margaritas were also first-rate. A fun atmosphere only added to the experience. I was particularly happy with the massive amount of sausage in my large burrito which packed a ton of flavor and a nacho app which could compete with the nachos at any Mexican joint. It’s a great place to eat or drink, but you earn bonus points if you’re doing both. Enio’s food was very good all the way around when we were there, but the Imported Bufula Mozzarella must have been created by the Italian god of awesome. The crisp bread base was only the start of a killer app which we topped with the garlic-loaded sweet tomato confit, basil, and balsamic. Easily the best buffalo mozzarella we ever had, my wife and I still talk about it to this day. If you go, you can be sure that anything you order will be yummy, but you’re truly doing yourself a disservice if you don’t try the buff mozz. It’s to die for. I’ve long been a fan of the grilled Caesar salad at Five Fifty-five. It’s always a bit of a surprise when I haven’t had one for a while and then take a bite and am reminded how great they are. My most recent visit didn’t differ from those experiences at all as the unusual preparation which adds a slight char to the romaine came through once again. If you haven’t had the longtime menu staple, you need to get one. I haven’t seen one prepared that way at any other establishment. Shay’s is a fun place with great drink specials and very good bar food. With their neighborhood feel and excellent bartenders, it would be easy to spend a lot of time sitting at the the bar soaking in the atmosphere and a number of drinks. My pineapple martini was amazing, so I would recommend that, but they also have a strong beer selection and whatever else you can imagine in the way of drinks. Find a bar stool, order a beer, follow it up with a sandwich or some nachos, and call Shay’s “home” for a few hours. Tiqa has serious food and drink, but what struck me as truly exceptional was their brunch menu harissa bloody Mary. I don’t like bloodys normally, but this one was the best I ever tasted. The skewer of extras only added to my satisfaction with the drink. Looking to nurse a hangover acquired from an overabundance of Saturday night sangrias? Make your way to the Tina brunch on Sunday morning for a little food and as many of those spectacular bloody Mary’s as it takes to be hungover on Monday too. There it is, my favorite restaurants of 2015. I suggest you run out and start going to them all right this very second and be sure to tell them Peterpeterportlandeater sent you. In the new year, I will bring you more reviews and more of everything you love about this blog. I’m going to try to add more pictures too because I care about your visual experience. Stay tuned for lots of fun food discussion and remember who’s your Portland Maine food hookup. This entry was posted in Portland, ME food on December 28, 2015 by peterpeterportlandeater. My wife and I love good dive bars. I generally think of them as decrepit to some extent, but the standouts among them exhibit a paradoxical contrast between the old, seemingly run-down decor and the quality food and drink they provide at a bargain price. These top neighbourhood locations provide a fun place to go, middling to great service – occasionally with a bit of a snarl, and a wide array of hours in which they do business. There are certainly other aspects which make some of them great, but those are the basics. With all that in mind, I went to Tomaso’s Canteen which popped up in place of Sangillo’s when the city – and then the state – would not renew their liquor licence. The first impression of Tomaso’s confirmed that it was indeed a dive, but not so much old or busted up. It looked new and nice, though not at all fancy. Since the previous occupant had such a big reputation, I was a little surprised that it was on the small side with maybe five tables and several bar seats. It was definitely cozy, but they had plenty of space for me which was all I really cared about. Overhead, running the length of the bar, was a chalkboard full of food and drink specials. We made our way to a table close to the kitchen and started looking at the menus sitting on it. I had a case of the hunger, so I was very focused on sorting through the list and picking something to chew on. In a weird move which definitely didn’t fit our surroundings, both my wife and I passed on an alcoholic beverage. Nonetheless, a thorough scan of the drink options revealed some nice mixed drinks, great beer and shot combos, and a modest but well thought out selection of both draft and pre-packaged beer. They also – like any good dive – had jello shots available. And in a play which makes any bar more endearing, Tomaso’s seemed to carry a good selection of local beer and spirits. We requested only waters and worked to finalize our food selections. When our high quality H2O was delivered, we were itching to put in our orders. We started with an app of Fried Mozz Balls to share and she went with the Fried Chicken Sandwich with a side of fries. I was craving something on the spicy side and settled upon a Buffalo Haddock Sandwich with a side of mac and cheese. I was ready to see what this kitchen was about, but had a lot of faith that they would meet my expectations for a number of reasons, not the least of which was that I had heard positive words about the owner’s other restaurant. We would soon find out. Our wait for food was a little longer than we hoped it would be. It didn’t matter though as we passed the time by playing patty cake with our feet and then drawing schematics for our newest Rube Goldberg machine. As soon as we got to the bird pecking on the button covered in sunflower seed causing the flag to rise and swipe a turning handle, our mozz balls were placed between us. I gasped. They were so incredibly displayed that I doubted they could come from a dive bar kitchen. The artistic presentation started with a martini glass. From there, a half lemon cut-side-down was skewered and placed into the glass. Next, it was filled to the top with marinara poured over the lemon and sprinkled with cheese and onion. Five fried balls were then added to the skewer and on top of those were a folded piece of radicchio and an onion designed to look like a pineapple. It was quite a sight to see. Almost not wanting to disturb our dish, I reluctantly dug into the cheesy spheres. I divided them unevenly with Mrs. Portlandeater receiving two and I three. We each forked some sauce into our plates and went to town. The balls were quite delightful and the marinara even better, taking some of the citrus from the lemon and adding a twist to the usual acidity of the red relish. We kept eating until those little suckers were done. My sole criticism of the app was that we could have used an extra one or two balls for the price of eight bucks. However, it was so pretty that I was totally mesmerized by it, so maybe that was enough to justify the cost. It wasn’t too long after our app was done that we were given our sandwiches. Hers came with plenty of chicken, lettuce, tomato, pickle, and a nice pile of fries. Mine had lots of haddock, lettuce, pickle, and a lemon slice. A radicchio garnish, along with some curly carrot strings and a side of ranch completed the plate. My side of mac and cheese arrived after my initial evaluation of the sandwich. The sides that can be ordered with the sandwiches are only an additional two dollars and my mac was definitely a good deal as I was provided a heaping pile of the pasta which was topped with crumbs and a few green onions. I decided to squirt some lemon juice onto my sandwich and then top it with – not to be too political – a liberal amount of ranch dressing. Trying to get an initial taste, I opened my mouth as wide as I could and it barely fit. Squeezing it in like my meal depended on it, I was able to get a reasonable sample of the spicy fish creation. I immediately recognized that there was a boatload of buffalo, causing an acute blast of awesome to my brain. All the flavors – buffalo, ranch, and lemon gave the fish an excellent combination of hot, cool, and some more citrus, and the grilled buns were the perfect container for the entire package of yum yums. It should be noted that very little sauce dripped out from between the buns which was quite a feat considering the amount that was on the haddock. We ate and ate, stopping only to take short breaths and stare lovingly at our food. Eventually, it was nearly gone and we were filled to the brim. I reminisced about the past hour and realized that while I was well fed, the meter where I parked wasn’t. I asked for the bill and hoped that there wasn’t another one on my car. Our total came to a mere 31 bucks before tip. We didn’t have any drinks, but we had lots of food. It was all very good, and that app…that app was simply gorgeous. We were both smiling and raved about Tomaso’s Canteen as a great place to go and not spend all our cash while still getting top notch pub grub. If you do go, be sure to sample one or more of their speciality libations and be sure you pay for parking. My only other advice? Go sooner rather than later. Now that’s the ticket! This entry was posted in Portland, ME food on December 22, 2015 by peterpeterportlandeater. The holidays are an expensive time of year, so I’ve been looking for restaurants where I can stretch my dollar. I came up with Taco Escobarr as a place were I could do just that, getting some – hopefully – good food and still keeping a couple dead presidents in the money clip. They are close to a number of other restaurants in the arts district on Congress St, many of which are excellent. I hadn’t eaten there in a few years, and since that time, the ownership and menu have both changed. I hoped the purveyor of Mexican munchies could hold its own in an area which certainly has fair share of competition, but doesn’t lack for foot traffic and hungry people looking to grab something to eat. We went there on a Friday to take advantage of the happy hour offer of free chips and salsa and discounted drinks. Since I was meeting my wife and arrived about ten minutes prior to her, I had the opportunity to have a nice sit-down with the menus. I browsed the drinks which included a large selection of infusions and then the food which showed some typical Mexican fare such as tacos and burritos with lots of choices for meat and vegetable fillings. When my wife arrived, we discussed our day, the available food and drink, and whatever else came to mind. She quickly decided on a cocktail – Mango Tangerine Marguarita with the house made mango-tangerine infused silver tequila and mango puree. I decided to pass and stick with the delicious Taco Escobarr water. When the waitress brought my wife her drink, we were prepared to place our food orders. She ordered 2 Crispy Tacos – griddle fried tortillas with melted Chihuahua cheese, green onions, cabbage, and cilantro. One was ordered with fried avocado filling and the other with pollo chipotle. I stuck with a trusty Burrito – flour tortilla, queso fresco, pinto beans, rice, guacamole, cabbage, pico de gallo, and crema. I ordered it guacamole-free, but there was an option to have it smothered in salsa and cheese, so for an extra three bucks, I went with that and the chorizo filling. 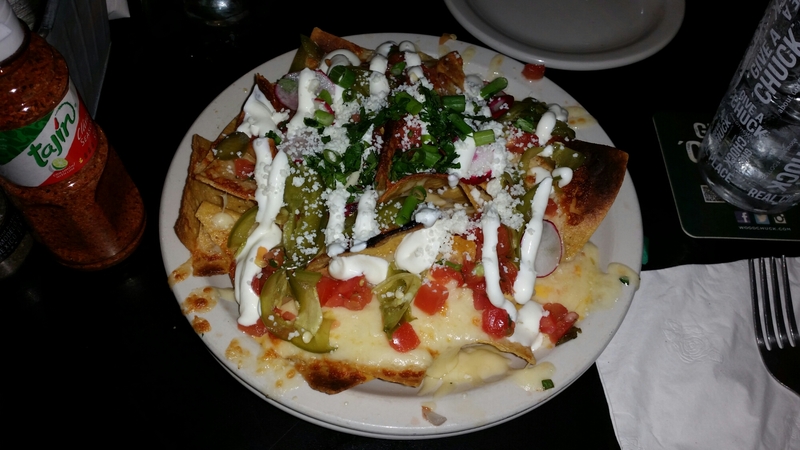 Then I threw in an app of El Ninos Nacho – chips, queso Chihuahua, pickled jalapenos, onions, radish, pico de gallo, cilantro, and crema – because I find it difficult to eat Mexican without gorging on some nachos. Mrs. Portlandeater sipped her margarita as the waitress walked away to put in our orders. Insisting that it was good, she forced me to try the fruity potion. I did. She was right; that beautiful cocktail made me feel like I was on the beach in Cancun. I felt a slight sea breeze fly through my perfectly coiffed beard and part it right down the middle. As she sipped the drink, we received some free happy hour chips and salsa. I tried them and was quite pleased with the zip of the tomato based topper. It was a tad spicy and well constructed. As I was munching on those, a large crowd walked in and took the restaurant from moderately busy to pretty much full. We sat and waited for our orders and played some games of Rock-Paper-Siccors-Lizard-Spock. After I won a best of seven series, the nachos showed up looking like a champ. With a small pile of chips and plenty of toppings including a zigzag of the crema on top, I was salivating at the thought of trying the Taco Escobarr version of one of my favorite apps. I chomped my first couple chips and was very happy with the results. There was no lack of goodness mounting them, and the creama was a perfect substitute for the more standard dallop of sour cream, giving the chippy concoction a refreshing finish after a flavor amalgamation delivered a nice touch to all my taste buds. Combined with cheese, hots, veggies, and the like, the nachos delivered a superb nacho nirvana. Nachos were done and before long, we were the proud recipients of tacos and a smothered burrito. My burrito was piled high, wrapped tight, and topped with lots of cheese, salsa, onion, and cilantro. I usually like to hand-feed my burrito into my burrito hole like a conveyor belt, but the smothering made that a very messy proposition. I skipped that thought and took the fork and knife in front of me and started to chop and poke the bulbous wrap until I had a piece ready to enter my face. I ate the bite and was seriously impressed. The house made chorizo was not only spicy, but was so plentiful in my burrito, I thought they might have thrown all of Porky into it. As I got further into my menacing Mexican mound, I found the non-meat ingredients, but they were smaller in proportion to the burrito than I was used to getting at other Mexican joints because they had to make space for all the chorizo in this one. While I enjoy the rice, beans, and other components, it’s hard to argue with lots and lots of perfectly created pork falling out of my food and acting as the primary part of the filling. It didn’t hurt that I also had lots of cheese and salsa on top of the thing. As I delved further into my chorizo rocket, my wife enjoyed her tacos which were topped with cabbage and onions. With our meal finished, I was ready to close out the food portion of the evening. The happy hour deals of free chips and salsa and a couple bucks off the price of the marg contributed to our total cost of about 38 bucks before tip. That was pretty good because we still ate a lot of food and because I was trying to save cash after buying lots of Christmas gifts. Taco Escobarr has a touch of street-foodiness and definitely has a fun, party-type atmosphere too with more spirit infusions than a satanic revival meeting. Plus, they’re open 11am – 1 am 7 days a week, so you can go just about whenever you have a craving for an assortment of the Mexican foodstuffs. Go there with the guys, the girls, or whoever you damn well please. I Mexi-can guaran-tequila you’ll love it! 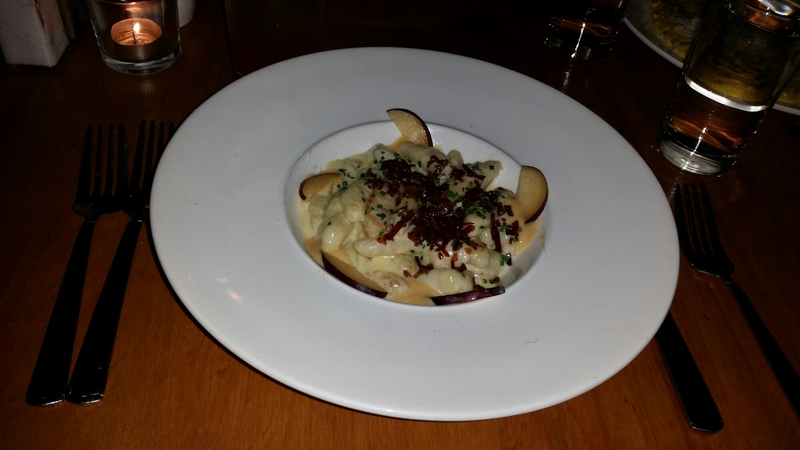 This entry was posted in Portland, ME food on December 18, 2015 by peterpeterportlandeater.